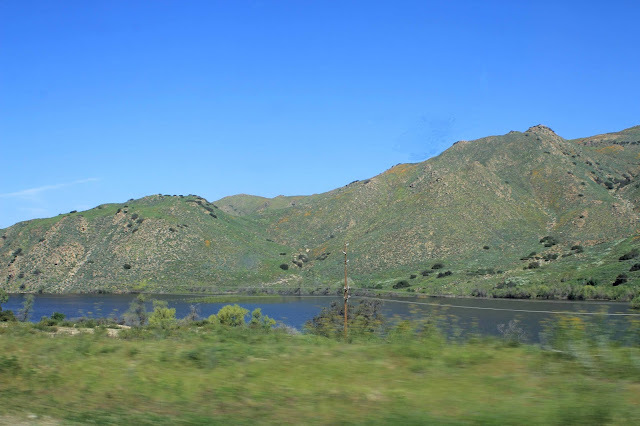 Corona Lake is a privately stocked lake east of I-15 off Temescal Canyon Road and used to be a popular fishing spot (fishing license not required) for bass, rainbow trout, tilapia, catfish, bluegill and crappie. They have a large sign visible off the freeway saying something along the lines of "Largest Trout in California Caught Here" (I believe the record was 24.5 lbs.). In 2016, we noticed that the water in the lake started evaporating over the course of the year until it looked more like a pond. Clearly, the the water in the lake was receding, not being replenished, and no longer in operation - surely because of California's ongoing drought. But then we had a wetter-than-expected winter this past season, so the lake is once again filled to the brim. The latest report from http://www.fishinglakes.com/locations/corona-lake/ indicates that, despite the auspicious rains, the lake is still closed to fishing. I imagine the lake has to be great for birding so will keep checking in on its status.